Don't know where this beast fits it. Last time I checked the weak spot for all these iphone devices was the 16bit recording capacity limitation. It has a battery lid, but it doesn't say anything about battery specs or running time on P48. 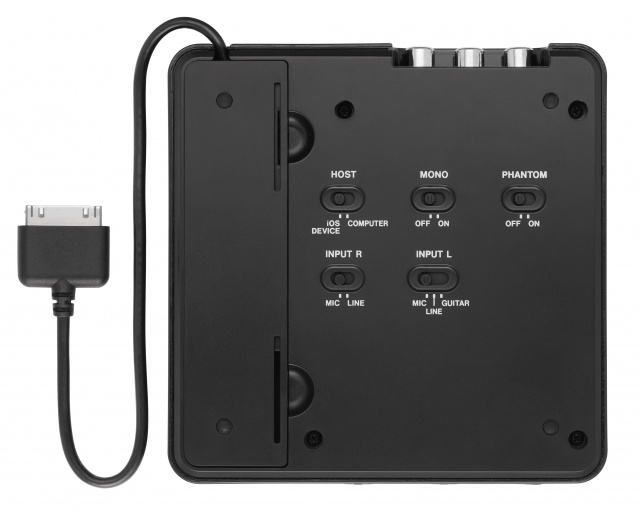 TASCAM’s iU2 is a premium sound quality audio interface for the iPad, iPhone and iPod Touch. It includes all of the features of TASCAM’s best-selling USB audio interfaces, including a pair of great-sounding microphone inputs. The XLR inputs have phantom power for use with high-quality condenser microphones. These feed an onboard microphone preamp and A/D converter for better sound performance than those built into iPhone and iPad – true stereo recording with low noise and less tendency to distort. The inputs also accept line-level signals or you can plug a guitar or bass directly into your device. In addition to compatibility with iOS devices, the iU2 also works with Mac and Windows computers. A zero-latency monitoring path allows musicians to hear themselves directly through the unit, without any distracting delay. MIDI in and out are provided to interface with synths and drum machines, and a digital output connects to digital mixers or recorders. the 'battery lid' appears to be a storage compartment for the iOS dock cable (if you go to Tascam's page, you'll notice that the iOS cable emerges from the iU2 in a different spot than the other interface cables in the sample pics). These are my mics. There are many like them but these ones are mine. My mics are my best friends. They are my life. I must master them as I must master my life. Without me, my mics are useless. Without my mics I am useless.